Just because I think both the detractors (read: haters) and the supporters of the newish Starbucks move to test the higher end specialty coffee waters have made some very salient points with regard to the changing dynamics of the specialty coffee industry. Starbucks MUST be respected for its sheer ability to throw money and professional marketing at any scheme that they arrange. 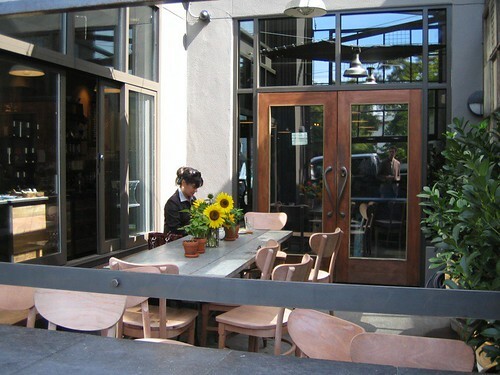 The hipster coffee house vibe — that many of the places that are charging $20 a pound for fresh roasted coffee from reputable outfits like Blue Bottle, Ritual, Novo, Intelligentsia and Counter Culture — does not appear to be something that the Starbucks corporate people will ever be able to roll-out on a large scale. What it does appear Starbucks’ wants is to leverage its sheer advantage in liquidity (read: lots of $$$) and marketing to increase their share of a market that is a sub-sector of their core industry. As a major buyer of green coffee all over the world it seems logical that they would leverage the best of their strategic relationships to promote higher premiums, no? 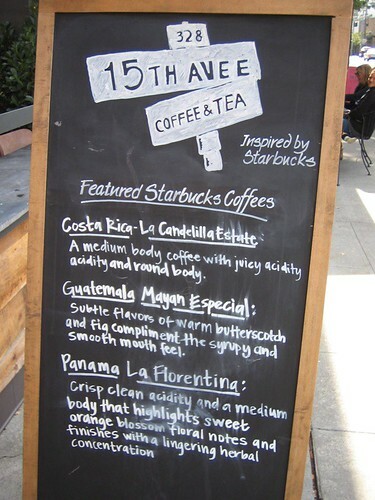 It makes perfect business sense and the following article gives a more balanced look at the non-hater side of the the 15th Avenue Coffee and Tea story. We finally made it to see the new 15th Avenue Coffee and Tea (”Inspired by Starbucks” as it says on the door) on Capitol Hill in Seattle. After all the specialty coffee hubbub, press, and dramaover what this means, and after reading the considerably dramatic yelp reviews, we had to see it for ourselves. It puts an interesting question out there – can Starbucks make a better Starbucks? In New York, when we first heard about it, we were skeptical. When we think of Starbucks, we picture the lines of caffeine deprived junkies queued up by the dozen, packed into a place pumping out big milky drinks by the gallon, with rarely a smile on any face – customer or barista. Like most situations in New York, the stakes are higher, and the throngs battle it out to make it out with their drink. Does it taste like coffee? Perhaps, but what’s most important is that you made it out with something hot and you’re still alive. 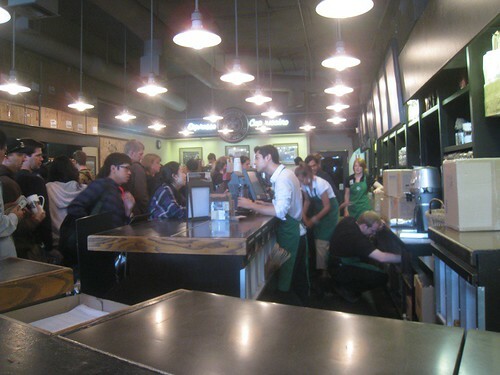 This is the line at the original Starbucks retail location at Pike Place Market, downtown Seattle. This location used to be a fine purveyor of coffee beans only; now it looks a lot like an everyday Manhattan retail location (read: packed and stressful). Starbucks’ reputation in New York is bad. And for people who’ve only known that big, corporate, bad-tasting, fast food retail-y experience, I don’t blame them. But as a Seattleite that grew up alongside the explosive growth of the company, I always speak positively of my very first experiences getting lattes at (where else?) Starbucks. And it was good. Our whole industry, and certainly my company, would be much less significant (even nonexistent) if Starbucks hadn’t tapped the consumer demand and opened the floodgates. But still, there’s no denying that Starbucks lately has fallen on hard times. The coffee just hasn’t been that good, the shops are kind of dumpy, all Starbucks’ seem to have an unpleasant smell (what is the deal with that smell?). I hadn’t had coffee from Starbucks (with the exception of a Clover coffee last year) in several years. Why bother, when there are independent places, with great coffee, and great service (you can visit our tour if you need tips) right around the corners from many a Starbucks in NYC? On the other hand, there are a lot of independent cafes that rest happily with the knowledge that they’re not Starbucks. But are they good? Well, no, not really. 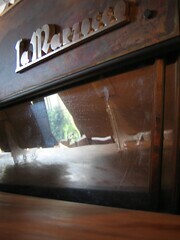 The coffee is ok, maybe some of the baristas are nice, and the atmosphere is decent. By and large, these cafes provide a sub-par experience. As consultants, we run into this mentality all the time, and are constantly checking that clients begin providing a much higher standard of service, and of course, most importantly, are providing the best possible product. There is simply no way that being “not Starbucks” is anything more than a lie owner/managers use to tell themselves they are doing a good job in their cafes. Most very high end cafes think of Starbucks as completely irrelevant – and while I think there are some great aspects of Starbucks (they’ve got independents trounced when it comes to retail and merchandising, for example, and it’s worth watching them for that), I generally tend to agree with the high end independents. So when we walked into 15th Avenue Coffee on Capitol Hill, steps away from Victrola, we were keeping all of our standards as high as we do at any shop we visit. What’s the atmosphere like? Are we greeted right away? Are the chairs comfortable and are there multiple types of seating? Can we see this space being multi-functional, serving a lot of customers from various backgrounds? And of course, how is the product? We were greeted cordially and were provided with some suggestions about what to try. I had a macchiato, and Neil got a Costa Rican coffee. We were served in porcelain cups. 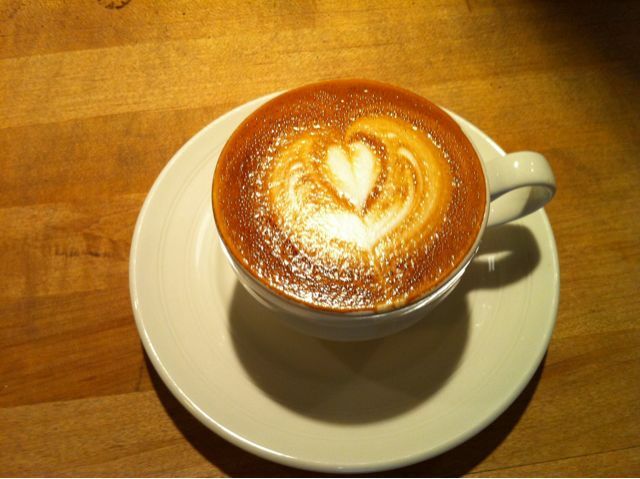 The latte art on my coffee was lovely. And most importantly, the coffee tasted pretty good. Maybe not the most unbelievable, delicious coffee in the world, but certainly pleasant and drinkable, and considerably better than many independent cafes in Seattle. I’m fairly certain that most coffee consumers wouldn’t see a discernible difference when picking between 15th Ave and Victrola in terms of cup quality. In New York, this shop could make a killing. Does that mean that Victrola needs to look out? It’s doubtful. 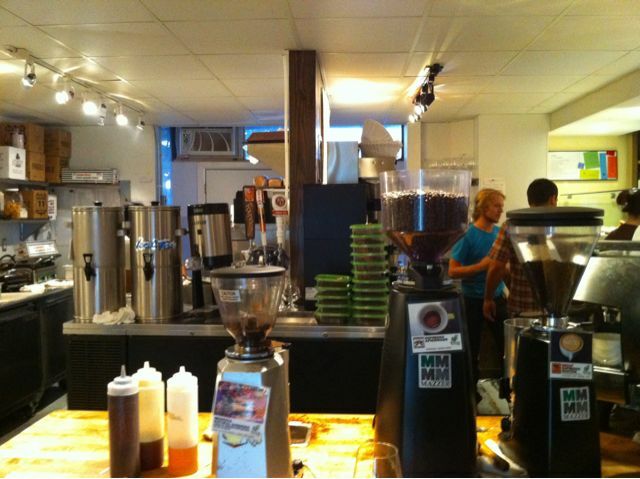 Victrola has a strong customer base and has been making great coffee for years. In fact, my theory is that Starbucks moved to that location to test the waters in a very tough location for them, just steps away from a high-end independent. In this spot Starbucks is definitely going to see if it’s possible for them to reclaim their glory as a high-end, products focused business. I think that for quality focused independents, this new incarnation will only increase awareness and bring in more customers, especially if they launch cafes in cafe-deprived areas. 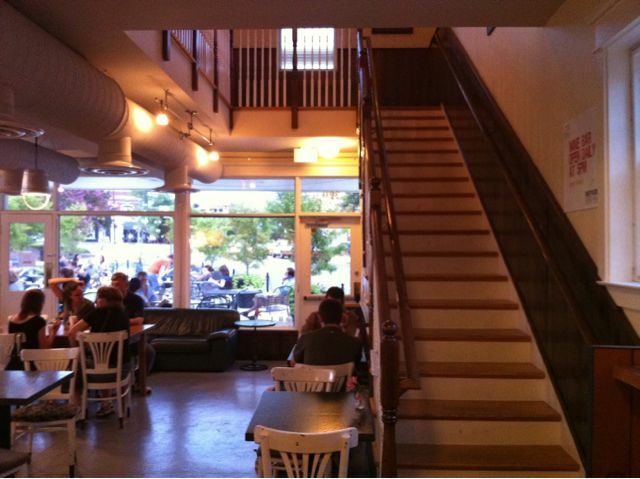 What about other, smaller, less quality-focused cafes? Should they be concerned? Absolutely — if you’re using Starbucks as your measuring stick. Those cafes are in trouble anyway, they just haven’t seen someone come along to challenge them yet. But look out, everybody. Here comes a company that means business and wants to reclaim what it has lost. 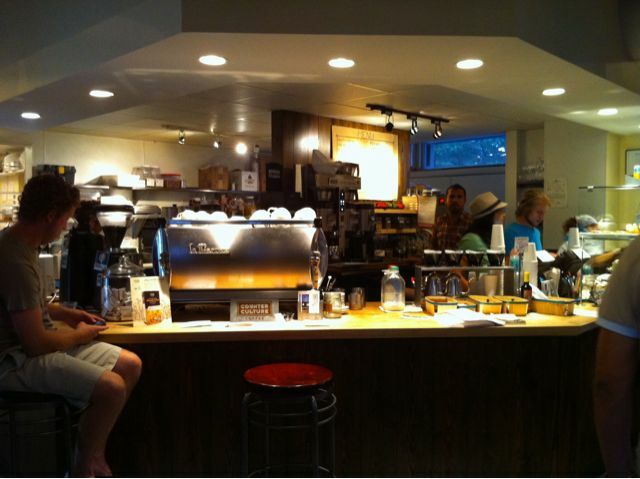 The illustrious Peregrine Espresso was my first real impressive specialty coffee experience in the Washington, D.C. area. It was quite a weekend for Cafe Hounding. Upon my first visit to this Eastern Market located shop I was admittedly distracted by catching up with an old friend currently working at Commerce but I was quickly brought back into focus when I entered this fine establishment and saw the fresh roasted bags of coffee sitting at the entrance. 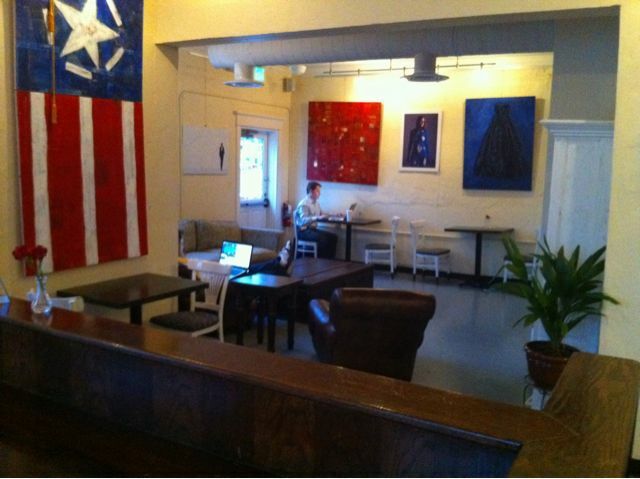 The ambiance is a pretty straight forward hipster look with chopped up doors hung on the wall for decor. The lighting is good and it was packed with people taking up all of the available seating with their laptops (and there is a pretty decent amount of seating too!). Granted, this was a Saturday at Eastern Market in the summer so this is probably about as crowded as it gets. The menu selection was very limited — a positive for me meaning that they do COFFEE here. Let me emphasize the quality of the coffee here. I entered and was able to choose between my very own personally drip brewed coffee from either Papa New Guinea, Ethiopia, Guatemala, Kenya or Honduras. All of these were roasted within the previous few days by Counter Culture down in NC and shipped same day up to DC. I can attest that the quality control in that process seemed superb to me. One, because the Kenya AA that I drank in the store went down pretty good although not as delicious as the Kenya AA that Caribou carries (sorry guys :-/). I’ll make a separate post on my experience with Kenya AA’s since it is probably one of my favorite single origins so I’ve tasted a lot over the years. I also sampled an espresso to get my palate around their custom blend of espresso. I must say, both the preparation of the espresso and the blend were sort of underwhelming on this visit. 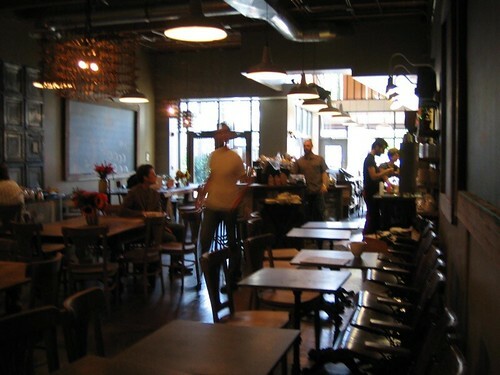 I have heard so much good about Peregrine Espresso AND I was very happy that the baristas were both very knowledgeable of the entire industry and of competitive barismo AND unpretentious. 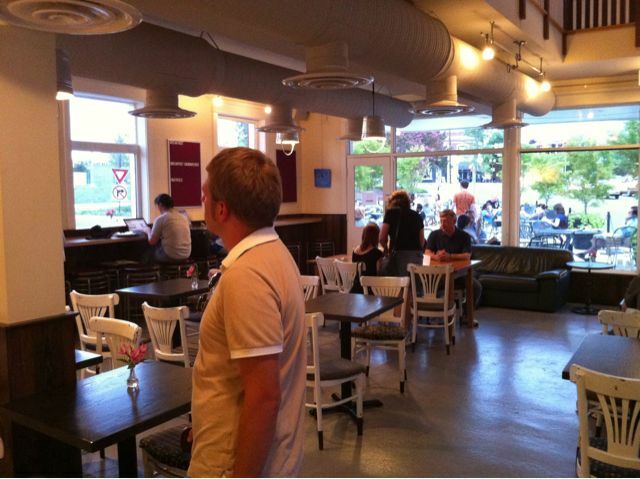 They have free wifi and a decent amount of indoor and outdoor seating. This is a great area of DC and thus, I’m sure they’ll do well for quite some time. It’s a must check out if you’re passing through The District. Thanks to David Flynn for his time and conversation while I picked his brain about specialty coffee. 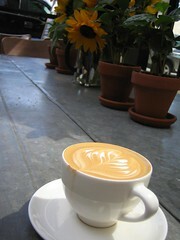 Flynn came in 3rd this past Feb 2009 in the Mid-Atlantic Barista Competition along with other local area talent. Peregine just opened in late 2008 and looks to have a lot of room to grow and prosper in the region.